Apple’s Developer’s Conference this year was one full of surprises for the people. Right now, the most highlighted news from Apple is the purchase of $3bn Beats. But, the conference was much more than just talks of new headphones; it was about soft wares. An inoffensive phone call was also made on stage to Dr. Dre. There were three primary factors that seemed to be the major focus point for the entire conference. The new message app is said to have features similar to that of Snapchat. For example it allows us to send an audio message with the help pf the Microsoft button or we can just simply hold down the camera button to send a photo or a video even. Only, Apple‘s app will be better than Snapchat because it allows a user to listen to an audio message by lifting the phone to your ear. Then, the reply can be spoken and on lowering the phone, the reply will be sent on its own. This app also provides group chat similar to that of Whatsapp. A ‘details’ option shows us the details of the other person’s location. Apple acknowledged the importance of China as the biggest mobile market currently. Several new practices have been introduced by Apple. The first practice is the official launching of iPhone and iPad in China, same day as they were launched in the US. 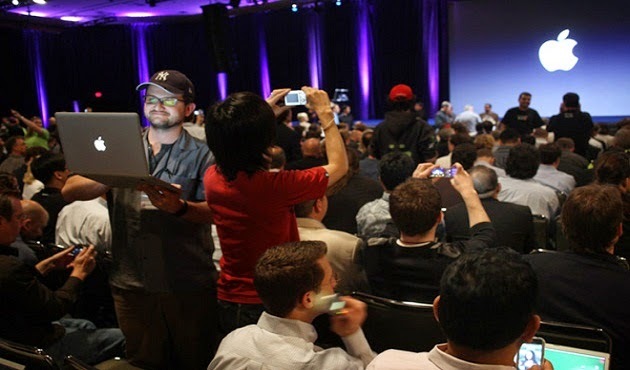 The second practice was that the iPhone giant held events in China’s capital city Beijing. Tim Cook, the CEO of Apple did not intend to hide the fact that in China in the past six months, Android users had switched to iPhones. A presentation was also shown which was dedicated to gear China. The presentation included improved maps, better weather data, supporting the lunar calendar and upgraded Chinese-language input. This is of the utmost importance as several small Chinese upstarts such Xiaomi provide intense competition to Apple in its home ground. Apple’s head of software development, Craig Fedderighi joked that people sitting at homes would be very confused and would not be able to understand the things being discussed at this conference because this developer’s conference is mainly for techies. The highlight that caused great implications was the announcement, which declared that Apple had come up with a new programming language by the name Swift. The coders in the audience were particularly shocked because of the introduction of a completely new language. The repercussions in the tech world would be highly interesting with this introduction.